WOW Dad, I am honored. I was aware that a new batman movie was coming out but I didn't realize it was this week. Thank you!!!! I look forward to seeing them in person. That is so awesome. 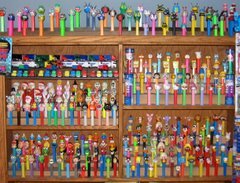 All PEZ are fun, but the evolution of these is pretty fun. I really like the touch of the batmobile in the background. Do we really have that many? Wow. Nice photography dad!!! !